Life had seemed to be going along great, Ron was traveling with a trio, and seeing many people won to the Lord. He and his wife were blessed with five beautiful children and a wonderful home. What lay ahead only the lord knew. In late 2002, Ron's wife was diagnosed with ovarian cancer. During this period of time, both Ron and his wife were self employed and had no insurance. The day the doctors diagnosed his wife she immediately placed this in God's hands. Standing upon the promises of God, she claimed the healing power of Jesus Christ over her body. In December of 2002, she began to experience pain as she had never before. 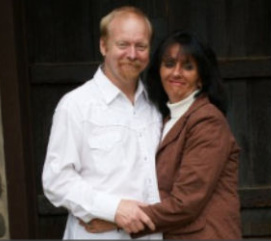 As the pain began to wrecken through her body, Ron began to pace up and down the hallway praying for God to touch and heal his wife. After crying and praying for God to show mercy, the lord spoke to Ron to get out of his "COMFORT ZONE." Crying out to God, Ron told the lord, "I don't understand." You will have to talk to me in a language I can understand. The Lord moved upon Ron to go into the wooded area behind his home and get along with him. In the midst of the cold December night of 2002, Ron found himself face down before the lord. As he cried and agonized with God over his wife's healing, the lord showed Ron that there was something he had to do. There was a calling he had placed upon his life and he must answer his calling. Six months prior to this, the lord had already been dealing with Ron about a full-time ministry, however, Ron continued to dismiss this, as he was happy and content where he was. Traveling with a trio he had formed, along side him was his son and his father. But, on that cold December night in 2002, Ron could no longer dismiss the calling God had for him. "Get Out Of Your Comfort Zone," and I will hear your prayers. Ron knew he had to obey the voice of the lord. Two days later his wife was admitted into the hospital and immediately placed on IV's and strong pain medications. They began running test, preparing for the worse. For five straight days, they ran test after test, however, each test continued to come back negative. On the fifth day, the doctor and the nurse came to Ron and told him, "Mr. Brewer," we cannot explain what has happened, but we cannot find the cancer, it is no longer there. Of course, we know who the great physician is and that Jesus Christ healed Ron's wife in the midst of the night when he obeyed the voice of the lord. The Bible teaches us "Obedience is better than sacrifice." This is why Ron travels across the United States, sharing the gospel of Jesus Christ. Not only did he come into this world and shed his blood for all our sins, but he spared the life of Ron's wife. Ron's new project entitled, "My God Still Moves," written by Shane Roark, is his testimony. Surely, My God Still Moves, no matter what your situation is today, he is the great physician and the answer to all your needs. Isaiah 53:5 - He was wounded for our transgressions. He was bruised for our iniquities. The chastisement of our peace was upon him, and by HIS stripes we are healed.